Party rental agency offering live event booking and all sorts of kids entertainment options including Bounce Houses, Inflatable slides, Carnival Rides and more. Book a Bounce is your source for inflatable bounce rentals in Connecticut and surrounding areas. With safety and cleanliness always in mind, you will find great bouncey rentals for your next birthday party or special event occasion. The bounce inventory at Book a Bounce is unequaled – you will have a huge assortment of bounce houses, themed bouncers, combo units, and inflatable slides all to choose from when you reserve your inflatable party rental with Book a Bounce. Tropical Bounce is an outstanding inflatables rental company serving the Connecticut area. 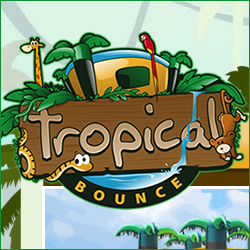 If you are looking for a tropically themed bounce house, inflatable slide with jungle theme, or tropical bounce theme combo bounce house and slide, contact Tropical Bounce today. When you rent inflatables from Tropical Bounce, you can be assured safety, quality, and cleanliness. Make sure your event goes off without a hitch – reserve Tropical Bounce combos for your next special event. PartyTime Rentals is a full service party equipment and rental company serving the Hudson Valley of New York, to Connecticut, and beyond. Weddings, corporate events, block parties, and more – PartyTime Rentals also offers tent rentals, concession equipment, flatware and glassware, as well as china, theme party items, and so much more! . . . Activate this business listing. Meriden Party Rentals is a family owned inflatable provider that is also fully insured and trained in ensuring your entertainment experience is a safe and fun one. Quality, cleanliness, and respect are things Meriden Party Rentals takes serious – contact them today for your Connecticut Party Rentals . . . Activate this business listing. 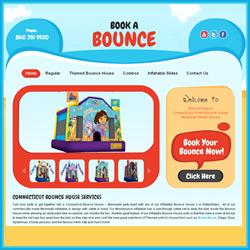 Airbounce Amusements is ready to bring the fun to your party or event in the Connecticut area. With great entertainment inflatables featuring wet and wild bounces and slides for those hot days, themed bounces for just what the birthday child wants, big and beautiful slide and bounce combos, traditional bounce castles, and huge interactive games, Airbounce Amusements has just about any inflatable rental you can imagine . . . Activate this business listing. I Luv a Party Let’s Have a Party presents Premier Events and Event Rentals in the Tri-state area. Imagine a one stop shop for all of your entertainment needs – with I Luv a Party you’ll find Inflatable Rentals, singing telegrams, balloon decorating, childrens characters, holiday characters, clowns, djs and bands, themed parties with the season, communion parties, and much more! . . . Activate this business listing. Innovative Inflatables is your source for inflatable entertainment rentals in the Tri-State area and New England. Whether its a backyard bouncey house rental, or a large interactive inflatable rental for a huge event, Innovative Inflatables is the company to call. Outdoor seasons are a great time to contact Innovative Inflatables for those birthdays, cookouts, graduations, corporate picnic events, and more . . . Activate this business listing. Funtastic Inflatables is a family owned provider of inflatable rentals serving the Connecticut area with great entertainment. 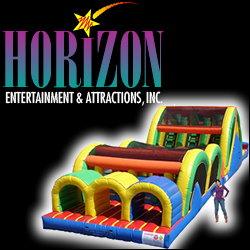 Inflatable equipment rentals include bounce houses, bounce slides, combo bounces, water slides, dry slides, mechanical bull rentals, rock wall, obstacle course rentals, tent table and chair rentals, dunk tank and concessions, carnival games, generator rentals, and more . . . Activate this business listing. Twinkle Town is a party planning company serving the Long Island area and beyond with great entertainment options like Inflatable Rentals and Bouncers, Clowns and Characters, Party Attendants, Themed and Craft Parties, Tattoos and Face Painting, Holiday Parties, Sports Rentals, Tents and Fun Foods and much more . . . Activate this business listing.